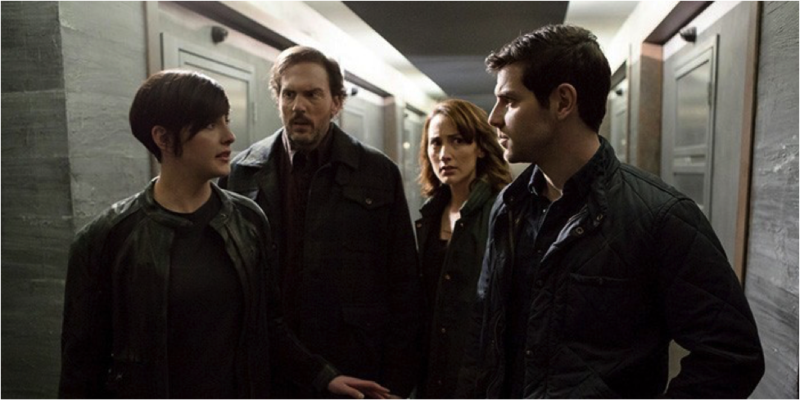 After a brief hiatus, Grimm was back this week in a big way. Let’s dissect the latest episode, shall we? Wu is dealing with the newfound knowledge that he’s a werewolf. And by “dealing,” I mean he’s super angry and throwing things. I guess we all deal with stuff in our own ways. He manages to make himself woge with his outburst, but is equally successful at calming himself down so he can consciously revert back to human form. This is the first time he’s managed to consciously woge and un-woge, and he’s pretty stoked that he’s learning to control it. This is all we get on this subplot though, because the rest of the episode is devoted entirely to Nick’s baby mama drama. 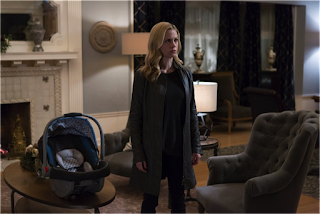 If you’ll remember from the last episode, Adalind has run off and taken her and Nick’s baby, Kelly, with her. We pick up right where that episode left off, with Nick reading the note she left. You know, the one where she tells him she’s doing this to protect her children and him. He’s furious and immediately springs into action, bolting out of the apartment and calling Hank on the way. Unfortunately, Hank doesn’t answer because he’s uh, otherwise engaged with Zuri, who just happens to be a member of Black Claw tasked with keeping tabs on Hank. I’d say she’s doing her job. Nick heads straight to Renard’s apartment, which has been completely cleared out. Meanwhile, Adalind arrives at a fancy mansion and Renard is there to greet her, as are a couple of beefy looking security guards. Renard tells Adalind they can be a family now, and he’ll care for baby Kelly as he would his own child. Adalind reminds him that he gave their child, Diana, away to the Resistance, so his promises in regards to Kelly aren’t all that reassuring. It’s clear Adalind is not going to just go along quietly with this plan she’s been blackmailed into. Shortly after Adalind gets there, Conrad Bonaparte shows up with Diana. Adalind introduces Diana to her baby brother. She wants to hold him but Adalind says that’s not a good idea because he’s so young. As soon as Adalind’s back is turned, Diana uses her powers to levitate Kelly above their heads. Though Kelly seems to enjoy it, Adalind is less than thrilled. She hides it well though, knowing that Diana is less than stable and prone to violent tendencies. Instead of getting angry at Diana, she simply says that’s not a good way to hold a baby. Nick’s next stop is Monroe and Rosalee’s house. 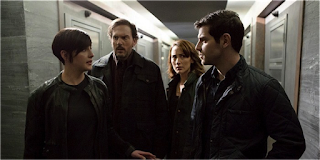 Nick is ready to kill Renard to get Adalind and Kelly back, but Monroe and Rosalee calm him down and talk some sense into him. They decide their best bet is to try to get to Hadrian’s Wall without Black Claw realizing what they’re doing. Nick makes short work of taking out the rather incompetent pair of Black Claw Wesen staking out Monroe and Rosalee’s house. As Nick and friends find out, Hadrian’s Wall has been keeping busy these past few weeks. They’ve identified almost all of the members of Black Claw and even created a nifty flow chart that indicates who reports to whom within the organization. They know Renard is pretty high up but they also know there are people above him pulling his strings. More important to Nick — they know where Renard is. They’re not particularly inclined to give up the location to Nick, who’s not exactly thinking rationally right now. They tell him they’re keeping tabs on the location but that it’s heavily guarded and he wouldn’t get in and out alive. While Nick consults with Hadrian’s Wall, Hank is fast asleep in Zuri’s bed. She’s not sleeping though. Too much devious back-stabbing to conduct. While Hank sleeps, she sneaks down and steals his phone out of his jacket pocket, delivering it to a creepy guy who just happened to be waiting on her doorstep. Creepy Guy runs back to his car — which is parked rather conspicuously right outside her house — and downloads all the info off Hank’s phone and onto a computer. Then he sneaks back in and puts the phone back in Hank’s jacket pocket. Unfortunately for Creepy Guy, a gust of wind blows the front door shut hard enough that Hank hears it from upstairs and comes down. Thinking this is just some random burglar, Hank knocks the guy out and then calls the precinct. Zuri plays innocent victim who’s just oh-so-happy big, brawny Hank was there to save her. I really need this chick to die. Back at the mansion, Renard and Adalind put Diana to bed and then step back into the hallway. As they stand there they find themselves holding hands, despite neither having an interest in any sort of romantic gesture. Adalind pulls away, thinking Renard caused it to happen, but he tells her he didn’t. They quickly deduce that it was Diana. She clearly wants her parents to be together, whether they want that or not. Renard says it’s a good idea, and tries to convince Adalind to “get with the program” but she’s not having it. He even follows her to her bedroom, thinking he can convince her with more than words, but Adalind throws a metal urn at his head and yells at him to get out. It’s finally starting to dawn on Renard that this might not be as easy as he thought. Adalind’s unwillingness to play along poses a complication for Renard and Black Claw, so Renard decides to give Nick a call and request a meeting. The requisite threats ensue and then they agree to meet in Renard’s office at the precinct. When Nick gets there, he demands his son back but Renard refuses. Instead, Renard tries his hardest to convince Nick to join Black Claw — to side with Wesen and take over the world. Nick refuses, obviously. With no other options out there, Nick heads back to his warehouse apartment, where Trubel is waiting for him. He decides to tell her about the magic stick that he and Monroe found in Germany (which I’m still calling the Elder Wand since the Grimm writers refuse to name it). He gives Trubel the overview: healing stick that saved Monroe’s life, also possibly a death stick according to the writings on the cloth that enshrouds it. Nick also shows Trubel where he’s been hiding it (in the caves under the warehouse). They are the only two who know its location. We’ll see how long that stays the case. The next morning, Nick meets up with Hank at the precinct and they fill each other in on their respective nights. Nick finds out about Creepy Guy (whose real name, it turns out, is Tony). Hank finds out about Adalind running off with baby Kelly and joining Renard and Black Claw against her will. Hank and Nick are pretty confident they can get Tony to talk, but they are mistaken. All they know for sure is that he’s a Wesen; they don’t know yet if he’s Black Claw. Nick tries to get Tony to woge by roughing him up a bit but it doesn’t work. He feigns ignorance about what Wesen even are. He woged in front of Hank last night, and he’s not a species Hank’s familiar with, so he and Nick decide to look through the Grimm books and see if they can identify Tony. With the help of Monroe and Rosalee they discover that not only is Tony a Kackenkopf (which literally translates to “poop head,” by the way), but this is also the Tony from Rosalee’s past. The smarmy one who showed up at the spice shop, demanded money, and threatened her before having every finger on his hand broken by a Hexenbiesting Adalind. That Tony. Needless to say, I did not recognize him as that Tony until the team explicitly pointed it out (thanks for those key reminders, Grimm writers). I guess the broken hand should have clued me in, huh? Just while they’re figuring out that Tony is definitely Black Claw, Wu gives them a call. He’s been deciphering the laptop they found in Tony’s car and discovered it has all of the info from Hank’s phone on it. Hank puts two and two together rather quickly and deduces that Zuri must have let Tony in to grab the phone and Hank intercepted him putting it back. So, FINALLY, the team knows Zuri is Black Claw. About time. They stage a trap for Zuri by pretending they’re going to move her to a safe house to protect her from Black Claw. In reality, they’re just waiting for her to make a move and contact her handler. She does and Hank is there to overhear it. She woges and attacks Hank, but she’s not the first Wesen woman to cross him and he knocks her out rather easily. When she comes to, she’s in the Hadrian’s Wall compound surrounded by Meisner, Trubel, and Eve. By the time Eve is done with her, she’s gonna wish she’d never met Hank. While the team deals with Zuri, Black Claw is gathered on the other side of town watching the mayoral race unfold. It’s voting day and Renard, Diana, Adalind, Bonaparte, and Rachel Wood are gathered around the television, watching the voting results come in. Bonaparte pulls Adalind aside and tries to get her to reveal the location of Nick’s warehouse apartment, which has still miraculously managed to remain a secret. Adalind refuses to help Bonaparte track Nick down. While Adalind and Bonaparte argue, Diana is shooting evil looks Rachel Wood’s way. If there’s one thing I’ve learned about Diana, it’s that when you’re in the crosshairs of this purple-eyed mini-monster, you don’t stand a chance. Oh, Rachel. You’re not long for this world. There’s still time to get your affairs in order before the finale. Best get on that. By the end of the day, the media has declared Renard the winner and the new mayor-elect of Portland. Renard takes the stage to do his victory speech and calls Diana and Adalind on stage, referring to Adalind as the “love of his life,” and referring to Kelly as one of his children. Nick watches from the television in the Hadrian’s Wall compound as Adalind takes the stage, looking petrified and holding baby Kelly. It’s clear she would rather be anywhere but next to Renard. The look on Nick’s face is murderous and sure enough, he utters, “you’re dead,” while glaring at Renard. Can’t say I blame him. Grimm is back to being awesome now that all the subplots are either wrapped up or clearly going to factor into the overarching Hadrian’s Wall/Black Claw showdown. The two-part season finale is coming up fast, and I can’t wait to see how it all turns out. I mean, obviously Nick will live to fight another day, but as for everyone else, we’ll just have to see. Grimm has killed off major characters before, so I just hope all my favorites are left standing. “I think we should wear something black.” Rosalee is always the practical one in a crisis.